Three possible etiological mechanisms have been proposed in the literature. These include the following: (a) an acquired pathological condition occurring after coronal development due to chronic apical inflammation of primary teeth, dental caries, or coronal resorption;,, (b) a localized developmental mineralization defect of dentine with or without an accompanying enamel defect during crown formation;, and (c) resorption superimposed on existing developmental defects. The most common etiology of this defect is the spread of infection from the infected primary teeth into the unerupted permanent teeth. These defects have been reported as early as 1941, but only four large-scale studies have been conducted to determine the prevalence of this condition till date. Although radiographs are routinely taken in children, the unerupted teeth are not examined meticulously. It is essential to increase the awareness among dentists regarding the occurrence of this lesion, for prompt diagnosis and treatment planning. There is a paucity of data on the prevalence of PEIR defects, and thus, this study aims to determine the prevalence of PEIR defects from OPGs in children <12 years of age. A total of 1000 standard orthopantomograms (OPG) of children below 12 years of age were collected. An unerupted tooth was defined as one covered by bone and/or mucosa and below the occlusal plane. All radiographs were examined by the same examiner and recorded for the number of unerupted teeth and the teeth showing PEIR defects. The lesion was then divided into grids using grid guidelines in Photoshop C S4 Software and the location, and the grade of the lesion was determined and classified. Grade 3: More than two-thirds of dentine thickness. The data obtained were tabulated and analyzed. The prevalence was calculated in percentage. A total of 1000 children's OPGs were included in the study of which 136 children were detected with PEIR defect, giving participants prevalence of 13.6%. The total number of unerupted teeth was 11,300 of which 136 teeth showed the defect giving teeth prevalence of 1.20%. The maximum prevalence of the defect was in the mandibular first premolar [Figure 1] followed by mandibular second premolar [Figure 2] and then maxillary second premolar. No defects were found in the maxillary central incisor, lateral incisor, and mandibular central incisor. The distribution of defects is illustrated in [Table 1]. The most common location of the defects was the mesial one-third followed by distal and central [Table 2]. It was found that 53% of the defects extended less than one-third of the dentin thickness (Grade 1) followed by 44% of the lesions extending between one-third and two-third of dentin thickness (Grade 2) [Table 3]. 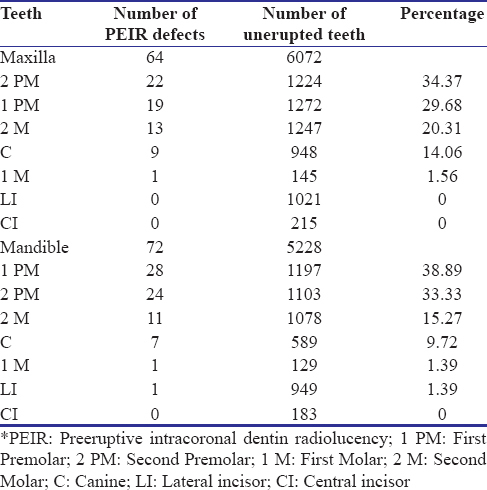 Although PEIR defects have been recognized as a clinical finding for more than 70 years, most of the dental literature related to these defects are in the form of case reports., This study is one of the few studies which evaluated the prevalence of PEIR defects. The tooth and participant prevalence of PEIR defects in the current study was 1.2% and 13.6%, respectively. Seow et al. in Brisbane, Australia, used panoramic radiographs to diagnose these anomalies and reported a participant and tooth prevalence of 3% and 0.5%, respectively. However, in another study, by him in the same population, he utilized bitewing radiographs and reported a higher participant prevalence and a tooth prevalence of 6% and 2%, respectively. Although the use of bitewing radiographs showed a higher prevalence, it is not a feasible method. Nik and Abul Rahman reported a tooth prevalence of 2.1% and participant prevalence of 27.3%. The higher prevalence rate was possibly due to the inclusion of the third molars as the sample age was up to 25 years. Whereas in the current study, the age group included was up to 12 years, and thus, third molars were not considered. Earlier studies have indicated that the most commonly affected teeth were the premolars, which is in accordance to the current study in which the mandibular premolars displayed the highest prevalence., In contrast, Seow et al. found that the most commonly affected tooth was the mandibular second molar followed by mandibular first molar. Studies by Al-Batayneh, Özden and Acikgoz, Nik and Abul Rahman reported that the majority of the defects were commonly located in the mesial aspect (>50%).,, In the current study, 52.3% of the lesions were located in the mesial aspect, 37.5% in the distal, and 10.2% in central location. This study also noted that of 53% of the lesions was less than one-third of the dentin thickness, and 20% of the defects extended to greater than two-third of the dentin thickness. Özden and Acikgoz observed that 39.3% of the lesions had extended to greater than two-third of the dentin thickness which could be due to the sample age included (47 years), the lesions would have increased in size due to its progressive nature. Although the etiology of the PEIR defects is unclear, there are various etiological mechanisms proposed in the literature. 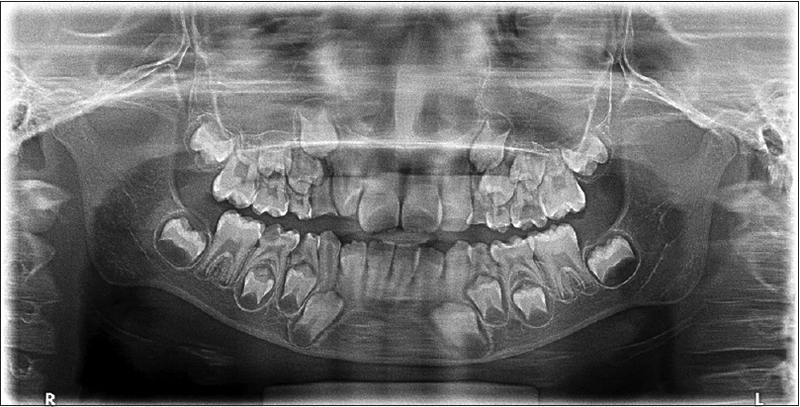 Majority of studies suggest that preeruptive lesions are resorptive in nature due to the presence of multinucleate cells, osteoclasts, and other chronic inflammatory cells., The presence of persistent infection in the primary teeth, leads to periradicular spread of infection into the bone covering the unerupted teeth, in turn leading to the formation of osteoclast type of cells. These inflammatory cells then invade the dental follicle covering the unerupted teeth leading to the formation of PIER defects., It is also speculated that preeruptive dentin defects may originate as developmental anomalies in which parts of the tooth are not mineralized completely. Studies have indicated that preeruptive dentin defects occur more frequently due to local factors rather than systemic factors and a higher prevalence of PEIR defects are seen in ectopically positioned and impacted teeth as compared to teeth in a normal position. The management of preeruptive dentin radiolucencies depends largely on the extent of radiolucency at the time of initial diagnosis. Several researchers suggest that a rapidly progressive and large lesion requires immediate surgical exposure and curettage of defects followed by lining with calcium hydroxide and restoration with dental cements or amalgam.,, However, if the lesion is small and the tooth is close to eruption, it may be advisable to continuously monitor the tooth, till it erupts to achieve occlusal access for the restoration of the defects. The participant prevalence of PEIR defects was 13.6%, and the tooth prevalence was 1.2%. The high prevalence of this condition indicates the need for increased awareness and recognition of this condition during routine radiographic evaluation. Preventive measures include the treatment of early infections in primary teeth, thus preventing periradicular spread of infection into the unerupted permanent teeth. This study is a milestone to spread awareness on the prevalence and clinical importance of PIER defects, thus aiding to explore the various treatment modalities. Seow WK, Lu PC, McAllan LH. Prevalence of pre-eruptive intracoronal dentin defects from panoramic radiographs. Pediatr Dent 1999;21:332-9. Brooks JK. Detection of intracoronal resorption in an unerupted developing premolar: Report of case. J Am Dent Assoc 1988;116:857-9. Rutar JE. Paediatric dentistry: Coronal radiolucency. Case reports. Aust Dent J 1997;42:221-4. Muhler JC. The effect of apical inflammation of the primary teeth on dental caries in the permanent teeth. J Dent Child 1957;24:209-10. Rankow H, Croll TP, Miller AS. Preeruptive idiopathic coronal resorption of permanent teeth in children. J Endod 1986;12:36-9. Ignelzi MA Jr., Fields HW, White RP, Bergenholtz G, Booth FA. Intracoronal radiolucencies within unerupted teeth. Case report and review of literature. Oral Surg Oral Med Oral Pathol 1990;70:214-20. Grundy GE, Pyle RJ, Adkins KF. 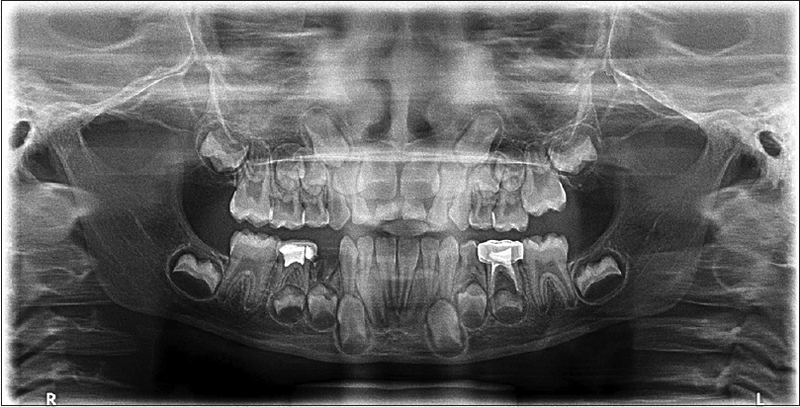 Intra-coronal resorption of unerupted molars. Aust Dent J 1984;29:175-9. Savage NW, Gentner M, Symons AL. Preeruptive intracoronal radiolucencies: Review and report of case. ASDC J Dent Child 1998;65:36-40. Skillen WG. So-called “intra-follicular caries”. Ill Dent J 1941;10:307-8. Davidovich E, Kreiner B, Peretz B. Treatment of severe pre-eruptive intracoronal resorption of a permanent second molar. Pediatr Dent 2005;27:74-7. Seow WK, Wan A, McAllan LH. The prevalence of pre-eruptive dentin radiolucencies in the permanent dentition. Pediatr Dent 1999;21:26-33. Nik NN, Abul Rahman R. Pre-eruptive intracoronal dentin defects of permanent teeth. J Clin Pediatr Dent 2003;27:371-5. Özden B, Acikgoz A. Prevalence and characteristics of intracoronal resorption in unerupted teeth in the permanent dentition: A retrospective study. Oral Radiol 2009;25:6. Al-Batayneh OB, AlJamal GA, AlTawashi EK. Pre-eruptive intracoronal dentine radiolucencies in the permanent dentition of Jordanian children. Eur Arch Paediatr Dent 2014;15:229-36. Seow WK, Hackley D. Pre-eruptive intracoronal radiolucent lesions in the permanent dentition: Case report. Pediatr Dent 1998;21:195-8.